The Logitrans GL-RF SEMI Stainless Steel Pallet Truck has been developed for environments where severe hygiene is needed on the surfaces that are in direct contact with the goods being handled eg. meat, fish or medicine. 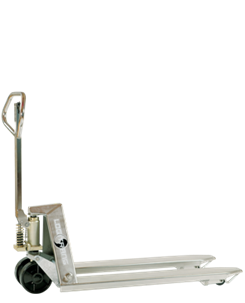 Logitrans offer a range of pallet trucks including stainless steel and explosion proof options. The Manual pallet truck is a means of easy pallet transport by the operator and the Logitrans stainless steel pallet truck range creates optimum working conditions for the user. No damage to surroundings, pallets and goods and it has an elegant design with rounded corners.